(Bloomberg Opinion) -- BlackRock would like to know how it feels to roll like a Blackstone. CEO Larry Fink, though, might be better off leaving that as a great unknown. On Tuesday, BlackRock, the world’s largest asset manager, announced its largest management reshuffle in years. The executive moves come after layoffs in January that cut 3 percent of the firm’s staff, its largest headcount reduction in years. BlackRock has struggled lately. Shares fell 24 percent last year, significantly more than the market. 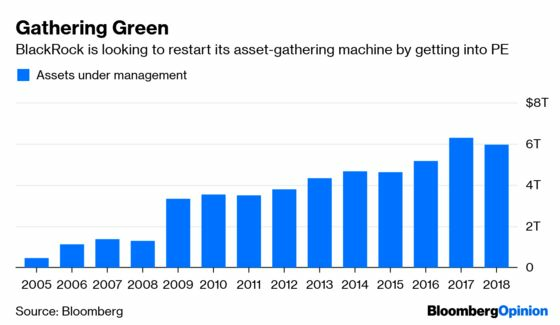 Assets under management in the last three months of 2018 dipped nearly $500 billion, to less than $6 trillion for the first time since mid-2017. 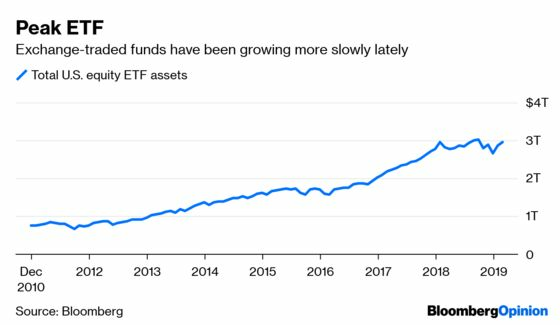 Bloomberg recently reported that BlackRock’s U.S. exchange-traded fund business, while still the industry’s largest, attracted fewer assets in the first three months of the year than rival Vanguard. Recently, though, it seems to be the other way around. Blackstone’s shares, including dividends, provided investors with a slight gain last year, far outperforming the market. Private equity funds nab higher fees and are typically more profitable for managers. Alternative asset funds at BlackRock, for example, make up just 2 percent of total assets yet generate nearly 8 percent of the firm’s revenue. And private equity is hot. About $757 billion flowed into private equity funds globally last year, the third-highest ever, according to Preqin Ltd. Asset flows into ETFs in the U.S. slowed last year to $315 billion, down from $467 billion the year before, according to ETF.com. What’s more, the price war in index and ETF funds intensified last year, with Fidelity announcing no-fee index funds and Vanguard responding with fee cuts of its own. The risk in any pivot to private equity is whether that is truly the best strategy for BlackRock and whether it would be essentially pawning what has been until recently a diamond of a business model. BlackRock, which recently announced that it had closed a $2.75 billion private equity fund, is far from the only firm that wants to do private equity deals. Mega real estate developer Brookfield Asset Management’s acquisition last month of Oaktree Capital Management was a sign of that. Also last month, pension fund giant Calpers said that it, too, was shifting more of its assets into private equity and that much of those investments would be managed in-house. What’s more, private equity has benefited from a multi-decade period of falling interest rates, so BlackRock and others may be getting in at the top, though the Federal Reserve has at least indicated a pause in its rate-hiking campaign. It’s also not clear how much BlackRock’s troubles are real or just a market perception issue. Yes, assets fell in the fourth quarter, but that was mostly because the market fell. Based on the same math, BlackRock’s assets most likely rose nearly $500 billion in the first quarter. Second, while BlackRock’s shares were down last year, they didn’t fall as much as asset-management rivals Franklin Resources Inc. or Legg Mason Inc. But the biggest issue is whether a private-equity heavy BlackRock would be a lot more valuable. While BlackRock’s price-to-equity ratio is down from 21 a year ago, at 16 times this year’s earnings, it still fetches a higher multiple than Blackstone, which trades at 13 times forward earnings. 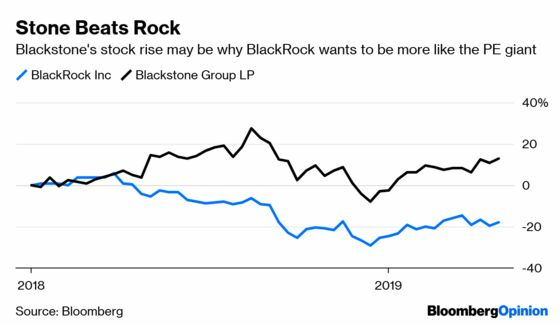 What’s more, BlackRock’s net income margin was actually higher than Blackstone’s last year, at 31 percent compared with 25 percent, though Blackstone looks more profitable on other measures. Investors did not initially cheer the moves, with BlackRock’s shares sliding a bit on the news. Private equity is certainly a popular path on Wall Street. But BlackRock may be better off with the direction it already knows.